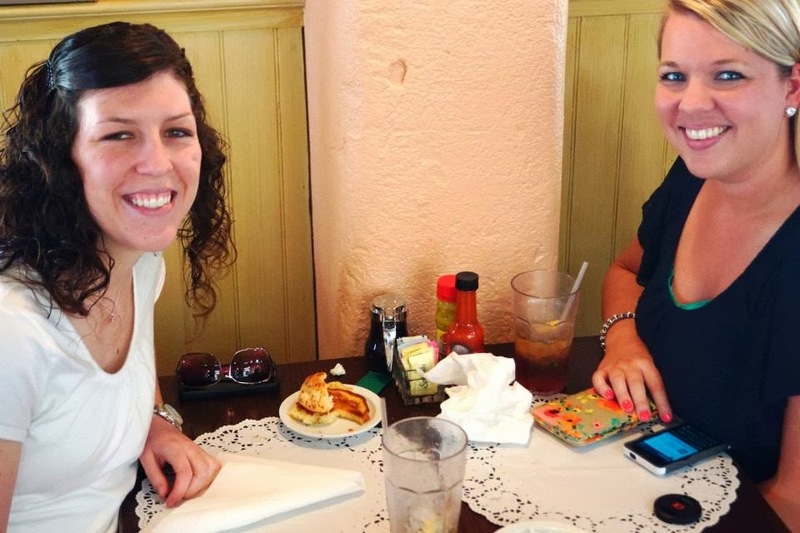 While on my trip to Hilton Head Island, and the surrounding area, Katie and I knew that one of the musts on our 'to do' list was to eat lunch at The Lady and Sons. Now friends, let me just tell you a little about mine and Paula Deen's relationship. My mother was the one that taught me how to bake, and during college Paula taught me how to cook. She taught me how to properly use a knife and chop, how to make the most amazing southern food, and so much more! Not only did I know that our visit to her restaurant would be amazing, but I knew that I had to see the beautiful restaurant of the woman that taught me to cook. We got reservations for lunch on Friday and after some sight seeing in Savannah we headed to the restaurant for the best meal of our lives! When we got there we were directed to the third floor and were so pleasantly surprised when we got off the elevator. It was a quaint dinning room and we were seated right away. Our waiter was wonderful and brought us two sweet teas right away. Let me just tell you, when the sweet tea is this amazing, you know you are in for a treat!!!!! Instead of ordering off the menu we chose the buffet, and let me tell you- BEST DECISION OF MY LIFE! We had fried chicken, several of the sides (ten available), and dessert too! I skipped the salad bar and didn't regret it one bit! Over the brief twenty four years of my life I have never once felt that I got my money's worth at a buffet until now. I am always ready to eat and can clean my plate, but going back time after time at a buffet is not something I ever do. Even though I didn't go back that day, I enjoyed every single bite I had. The fried chicken was to die for. The yams melted in my mouth. The mac n' cheese was heavenly. The black-eyed peas were out of this world. To summarize, this was one of the best meals of my life. This and the soft serve ice cream from Hawaii will both be served in Heaven, I am sure of it! If you ever get the chance to stop by for lunch, you must! It was a great experience and I am so happy that I go to share the meal with Katie!